In a room with curtains drawn, and candles lighted, I sit before a crystal ball. In 1894, The Cross House was built in the best neighborhood in Emporia. The neighborhood was very close to downtown, and this was the reason for its creation. In 1894, people walked. And downtown was where the stores were, and theaters, doctors, churches, and just everything needed to sustain life. Then came the automobile. Suddenly, a tectonic social shift occurred, and people no longer needed to be close to everything. Sixth Avenue, next to the Cross House, became a highway, and by 1910 the entire neighborhood was in decline. Poeple no longer wanted to be close to downtown. This happened across America, in every city. 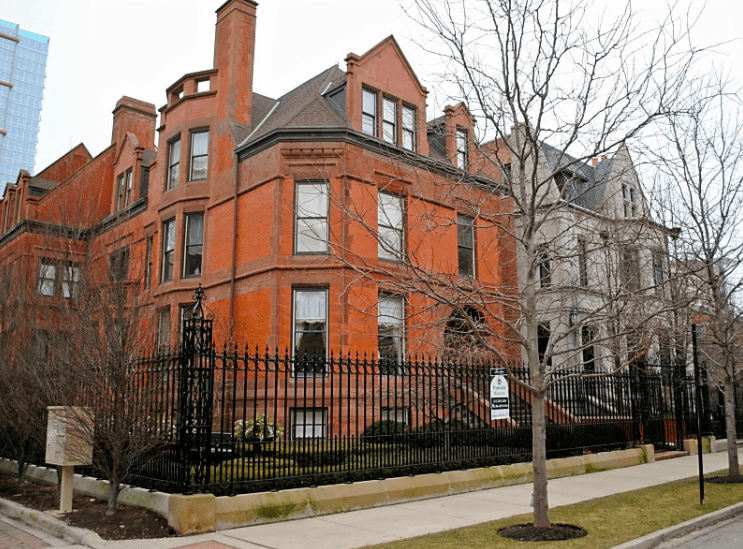 In Chicago, the magnificent stone Glessner House was built in 1886 on prestigious Prairie Avenue. The grand mansion was wholly surrounded by equality imposing edifices. Prairie Avenue was, conveniently, close to downtown. By 1910 the entire neighborhood was in a steep decline, and for the exact same reasons the Cross House neighborhood was. When I visited the Glessner House in the late 1980s, I was shocked by its surroundings. 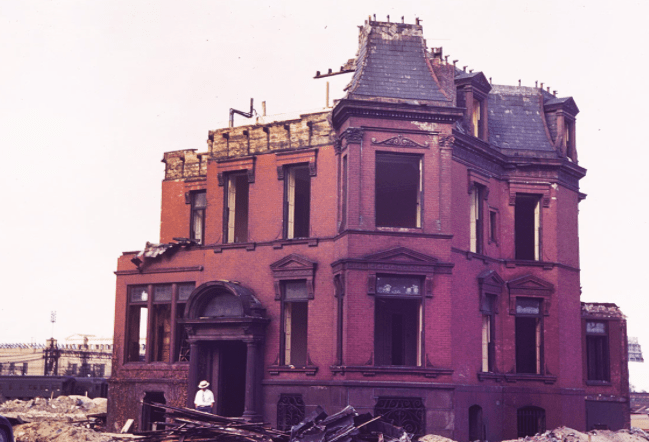 The house was surrounded by vacant lots, all that remained of burned-out houses. Some mansions had burned out but were still standing. Many mansions were now parking lots or dirty 1920s factory buildings. The once magnificent Marshall Field Jr. mansion was abandoned. Across the street from the Glessner House stood a fine mansion still, another improbable survivor, and now offices for lawyers. In the late 1980s, what was once a neighborhood with hundreds of imposing mansions was a desperate place with a handful of mansions. The neighborhood was grim, and not a place to be at night. Imagine my utter shock to discover a miraculous transformation decades later. 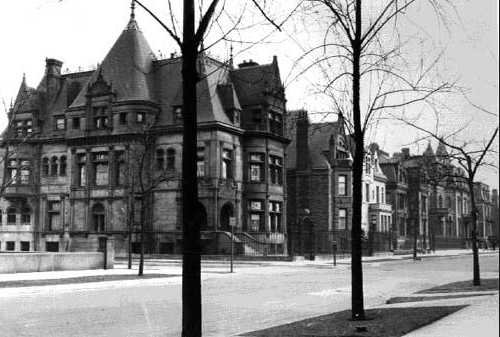 The Glessner House still stands, proudly, but is now surrounded by a lush, gorgeous neighborhood filled with new townhouse, apartment towers, parks, and people. A lot of people! The Marshall Field Jr. Mansion is restored, and now condos. People want to be close to downtown. This dynamic is happening across America. Prairie Avenue, Chicago, circa-1890. Only the two mansions on the left are extant. The William Wallace Kimball house is the one on the corner. TODAY: Marshall Field Jr. Mansion. Note the new glass tower to the left, and the stone mansion to the right. The latter is also new! Prairie Avenue TODAY. The Glessner House is to the right, and on the left is the William Wallace Kimball house. Who would not enjoy living here? Prairie Avenue TODAY. Everything you see is new. Including the townhouses. When I moved to Kansas in 1996, Emporia’s main street (Commercial) was, well, OK. It was not great. Not so today. The empty and decaying Granada Theater has been restored and is full of events and life. In 1996 one could not get a cup of good coffee downtown. Today there are plenty of options. While countless downtowns across America have not witnessed new construction in sixty or more years, Emporia has numerous new buildings which have sprouted up. Two new structures (and a third being built) particularly warm my heart. These are three-story buildings, built right along the sidewalk, with retail on their first floors (fully rented! ), and apartments above. This is miraculous. Commercial is today lined with trees, flowers, and lovely new lamp posts. And there are hip new restaurants. Who could have predicted all this since 1996? Just north of the Cross House, across Sixth Avenue, once stood a fine home. Today, it is the Splash & Dash car wash.
Just west of the Cross House, across Union Street, is a banal 1970s one-story commercial structure and large parking lot. The neighborhood is rich with the oldest homes in the city. But there are empty lots, many apartment buildings cheaply built after 1960, some beautifully restored homes, and a great many historic homes needing restoration. The Cross House is the most prominent building in the neighborhood. But no one has any memory of it looking truly gorgeous. It has been derelict-looking for a long time. This was originally the best neighborhood in Emporia. It could be again. The Cross House is on the SE corner of Union and Highway 50. It is not just pride of ownership which makes me state the following. The Cross House looks better now than it has in decades. Hugely better. This thrills me. By the end of the year it will look even better. And even better in the next few years. When the exterior of the house is completed (estimated in 2017) and the grounds lushly landscaped, the house will be a KNOCK-OUT. When people drive by at night, and with the house all lighted up inside like a glorious beacon, and with its forty stained-glass windows magically glowing like jewels, I will worry for traffic accidents! By 2017, what has long long long been a neighborhood eyesore will become a neghbohhod treasure. And this will have some ripple effects. I see things which will amaze people. I see the Splash & Dash carwash being replaced by a block of three-story townhouses. Parking will be tucked under the houses, accessible by a rear alley. The houses will all face south, and with the magnificent Cross House right across the street. At night, residents will have the best view in the city: the Cross House lighted up inside like a glorious beacon, and with its forty stained-glass windows magically glowing like jewels. I see the commercial building and parking lot west of the Cross House also being replaced with townhouses. I see many multi-family historic houses being converted back to single-family and restored. I see post-1960 apartments houses being upgraded. Some will be replaced by new houses/townhouses. 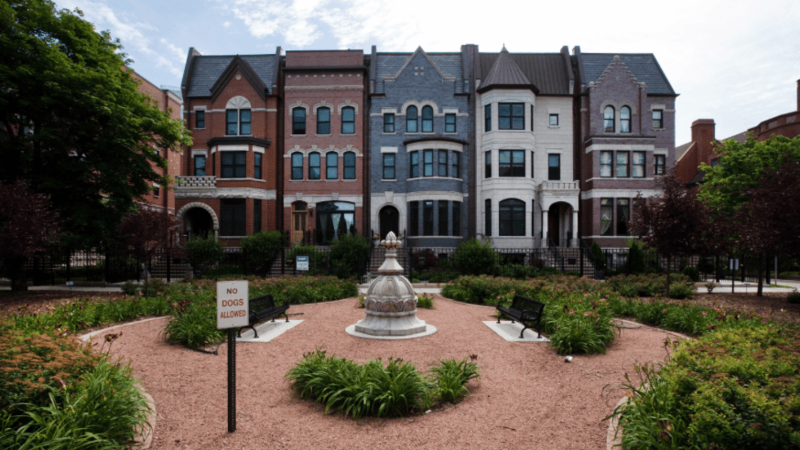 I see the neighborhood being designated a historic district, and special tax credits and other grants will jump-start restoration work (as happened with the Prairie Avenue Historic District, and countless other such districts). I see the neighborhood receiving a name, like perhaps The Old East District, and people will clamor to buy homes in The Old East. All street signs will, under the street name, state: OLD EAST DISTRICT. There will be walking tours of the district, block events to raise money (for landscaping and other cool things), and a website. This is what the crystal ball sees. I love YOUR crystal ball, Ross. What does it say about my neighborhood? Plus I don’t think you have to wait for all 40 stained glass windows to be aglow before you worry for traffic accidents. Sometimes even now I notice a bit of swerve in my car when I drive by because I don’t want to miss seeing any part of the grand dame’s “transformation.” Yeah, I know “restoration,” but it goes deeper than that now, doesn’t it? Exactly what I we were hoping to spur when we purchased our neglected Victorian 18 months ago here in Sioux Falls. Our house is 1 block from downtown, which in the last few years has become the hotspot for housing. On my block, they are 5 Victorians left, two of which are individually listed on the National Register and are both owner-occupied, single family. The other 3 are rentals in need of help. The rest of the block is 1960s brick apartments. I am so hoping that some day these will be row houses, as you showed. Our neighborhood association is meeting next week with city planning… Wish us luck! I wish you, your husband, and family great luck!!!!!!!! NOTE TO READERS: Ovedia has a blog on her old house adventures. It feels good to “be the change,” no? Ross, you are such a wonderful writer that I can just SEE your vision, and I hope it comes true! 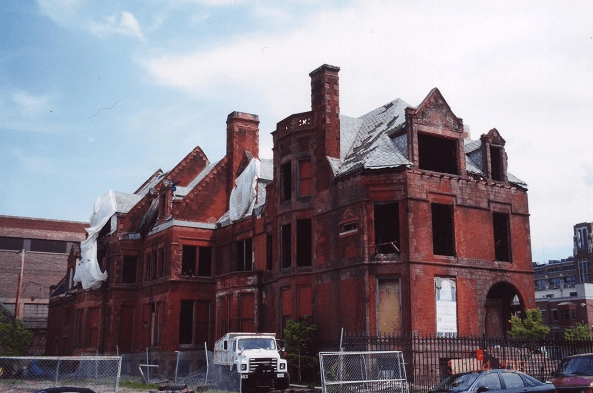 The photos of the decrepit houses (now restored) in Chicago remind me of the ones I have seen in the Brush Park area of Detroit, and they are slowly coming back to life. St. Joseph, MO is beginning a renaissance, which I hope continues. You are doing such wonderful work on your amazing house, and are an inspiration to preservationists everywhere. I’ve been following your awesome blog for a while now, and I gotta say it’s on my top five of favorite house blogs! Your writing style and care and love for your beautiful house is so inspirational and I think it’s very admirable that you took on this massive project! I’m currently studying history and will hopefully progress with a masters in architectural history once I’m done here. I came to Canada because I wanted to work with these old houses (Victorians and second empire are my favourites) and hopefully one day I can buy one as well and be on the team that rescues these dear old ladies! I’m happy too that there seems to be a change now, slowly though, that makes people appreciate old buildings and local history and not necessarily buildings that require no maintenance what so ever..